Our wonderful summer ended today as the new school year began. 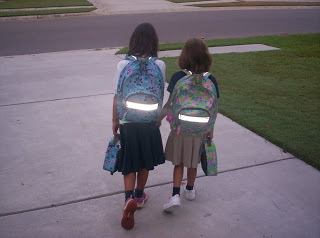 Funny how easy it is to get the girls up and going on the first day of school! Maybe it was the cinnamon rolls for breakfast and our tradition of giving them a little gift for the first day of school. I know that not all of the other 179 days will go quite as smoothly!! They were both so excited! I hope and pray that this school year is all they hope it will be; that along with the academics, they will learn spiritual and life lessons that will serve them well in the future. They look so cute walking hand-in-hand together 🙂 I hope they have a great school year.